Battle Chef Brigade review: "The package here is robust, filling, and relentlessly charming"
Kickstarted by Trinket Studios back in 2014 and published by Adult Swim Games, Battle Chef Brigade for Nintendo Switch and PC is a bit like a peanut butter and jelly sandwich - if peanut butter were deadly monsters and jelly was a cooking reality show. You play as Mina Han, a young cook who lives in a world where chefs are equal parts monster hunter and baker. The topmost chefs of this universe not only prepare their food, they hunt and battle it. Known as the Battle Chef Brigade, these elite kitchen warriors include humans, orcs, elves, undead David Bowie lookalikes, little girls with walking oven mechs, and much more. To prove themselves worthy, would-be members of the Brigade must complete a series of challenges where they fight and craft the most delicious meal for a presiding judge. And Mina has been dreaming of being a Battle Chef since she was little. The plot is a family-friendly tale of believing in yourself that you've heard a hundred times by now, but it's told well through endearing characters and is surprisingly substantial. 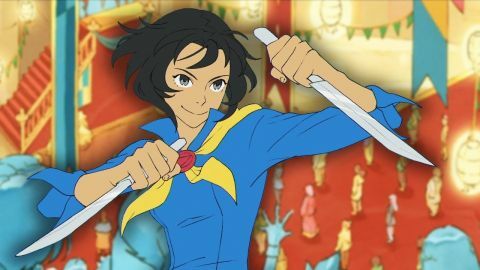 Mina and the Battle Chef Brigade cast are ludicrously shippable characters, which is to say they are both pleasing to the eye and possess distinct, engaging personalities. Mina and orc competitor Thrash take center stage in story mode, but the rest of the crew are equally likeable, and everyone is voiced with enthusiasm. Think of the setup as an anime-inspired fusion of Iron Chef and Dungeons & Dragons. The world is as colorful and inviting as some of the best in Japanese animation, the D&D inspirations show through in the fantastical beasts you'll face, and just like on Iron Chef, it's all to see who can be the very best chef in the land. Heck, there's even a character who dresses like Chairman Kaga and announces theme ingredients like his American counterpart. To this end, a typical Battle Chef Brigade match is divided into two parts: side-scrolling action game, and match-three puzzle game. You'll start by heading into the wilderness just outside your kitchen, and use a mix of martial and magical attacks to defeat the dangerous monsters who live there. Killing these beasts will let you use them as ingredients in your meal, so you'll feel pushed to become an efficient fighter so as to more quickly gather your supplies. Save for the toughest of foes like a dragon or hydra, combat isn't very difficult. It is, however, very satisfying. You could, for example, dash through the air and kick downward onto a beast, stunning it as you backflip away and toss two flaming daggers at it. You would just about obliterate any of the small monsters with that relatively simple combo, but you'd feel pretty damn slick and cool doing it. Once you decide it's time to cook, Battle Chef Brigade captures the feeling of preparing a dish from memory but adding your own little twist on it. You'll have a pantry full of the monsters you've just hunted and ingredients you've gathered, and each one will have a unique set of elements associated with it. A spicy fruit, for example, might be composed of one Fire element and one Earth element. A vicious piranha plant could be two Earth elements and one Water element. You drop these ingredients into your pans and ovens, Tetris-style, and "cook" them by matching three elements in a row. As you match more and more of the same elements, those flavor profiles become stronger, and earn you more points. Turn in your meals to the judges before the time limit is up and they'll comment on how well you did before offering a final total score. As the difficulty ramps up, you'll have to start dealing with bones, poisons, and fragile elements, while serving up to three judges simultaneously. This match-three system is not so precise that you're stressed about having the exact right ingredients in the exact right amounts, but you're not just throwing random stuff in a pot and calling it a day, either. You'll need to pay attention to how well you're blending your ingredients and how evenly you've distributed them, but putting a dash of Water in an Earth-based dish won't ruin your score. If you mess up, there's usually some way to redeem yourself and come back. I say usually because, while rare, sometimes judges would berate me for not including enough of a particular element and I would feel cheated. "How is that not enough Fire elements for you?!" I'd occasionally curse at the screen as if I were arguing with a picky significant other. Still, you feel smart for creatively positioning or rotating your elements, and the game rewards you with a more mouth-watering final dish. As you progress through the story and unlock new types of ovens or score-boosting items (such as a book that grants extra points for using five or more of the same ingredient in a dish), you'll constantly be finding new ways to change up and bend the rules, and feeling oh so clever about it. In short, the way Battle Chef Brigade handles cooking is forgiving, but challenging; ever-changing, but ripe for improvisation. You can participate in these cook-offs by playing through the game's story or via a daily challenge leaderboard. Multiplayer is asymmetrical and carried out via leaderboards. This means no head-to-head with any other chefs in the household, which feels like a missed opportunity. Mina and Thrash are also (currently) the only characters you can select, though it feels like any of the various NPCs you take on in story mode could easily become a future playable character. While the Iron Chef-style challenges are at the heart of BCB, they're not the only option. If you're a solid fighter but not so great a cook, you can practice your skills in a challenge mode where you have to quickly arrange ingredients according to instructions. If the opposite is true, try out the "Break the Dishes" challenge, which plays almost exactly like Super Smash Bros' "Break the Targets" mini-game. You can gain XP and raise in level for doing these side modes, but things feel underdeveloped in this area. There's no immediately clear reason why you would want to participate, since there don't appear to be any permanent or worthwhile rewards. I completed a few challenges and all I noticed was my icon changing through various forms of silverware. Even so, don't mistake Battle Chef Brigade for a thin, simple game. The package here is robust, filling, and relentlessly charming. Gameplay is expertly streamlined so that you alternate between feeling like a powerful fighter and feeling like the most brilliant gourmand in the world. You can make the exact same meals or order the exact same food from your favorite restaurant every time. But you've never experienced a flavor fusion like Battle Chef Brigade before, and I highly encourage you to try a bite.